Single split shaft collars leading manufacturer – Kiesler Machine Inc. Single split shaft collars ensure even distribution of clamping forces along the circumference of the shaft. 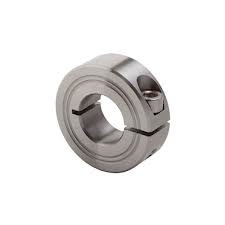 These industrial shaft collars are appreciated for their excellent holding power and exceptional performance in demanding industrial applications. Moreover, they are popular as they are easy to install/remove and easily adjustable. At Kiesler Machine, Inc., you can procure this innovative product in preferred bore sizes as required for your application at economical prices. Constructed using 303 stainless steel; hence guarantees a superior level of corrosion and oxidation resistance. Manufactured with superior finish and fit. Single split industrial shaft collars are made to last. They are unaffected in varied temperature ranges and when in contact with harshest industrial environments. Where are they Typically Used? We are committed to providing maximum support to customers by keeping our price low, while not compromising on the quality. We provide exciting discounts on large volume orders. Even in our tight business schedule, we ensure that our products are delivered on a schedule meeting your requirements.